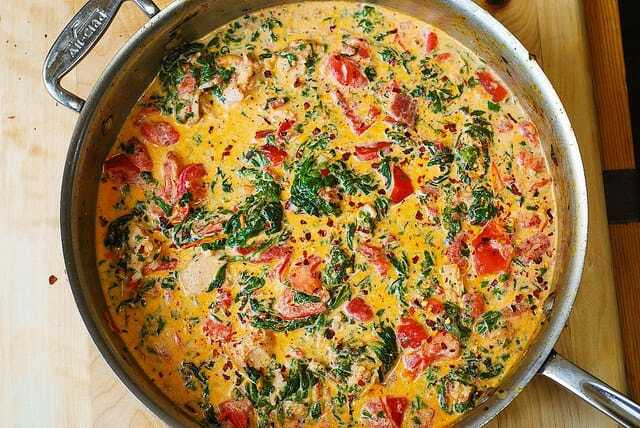 Chicken and Bacon Pasta with Spinach and Tomatoes in Garlic Cream Sauce – an Italian-inspired dish with lots of vegetables! 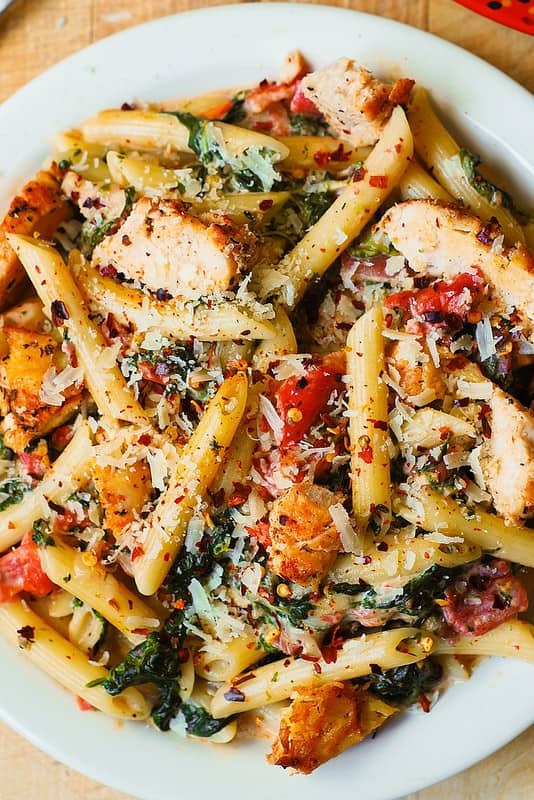 Sliced chicken breast and bacon are tossed with veggies and penne pasta in a delicious, creamy, homemade Alfredo sauce made with Parmesan cheese. Craving an easy-to-make comfort food that a whole family will love? Then, make this chicken and bacon pasta! Cream sauce absorbs the wonderful flavors from the ingredients in the recipe, and with every single bite, you get all the goodness and all the flavors! 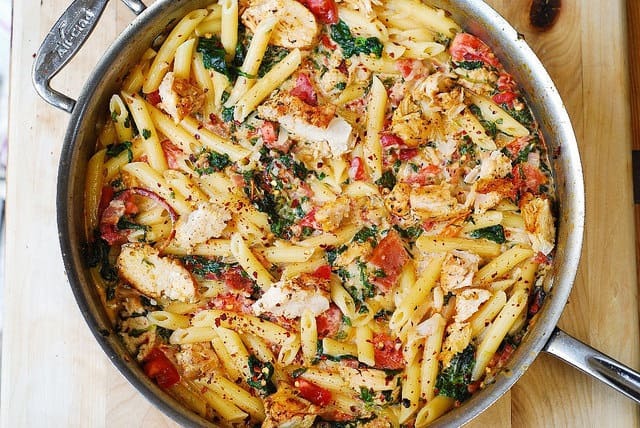 This is one of the best chicken pasta recipes you’ll ever try! Use thin chicken breasts or chicken tenderloin meat. Either cut of meat will work. Use shredded Parmesan cheese. Do not use grated Parmesan cheese, use the shredded kind. What I usually do is buy a block of Parmesan cheese and shred it myself. Freshly shredding the cheese results in the best sauce texture. You can, however, use store-bought pre-shredded Parmesan cheese. Just do not use the grated kind. Make this chicken pasta gluten free. 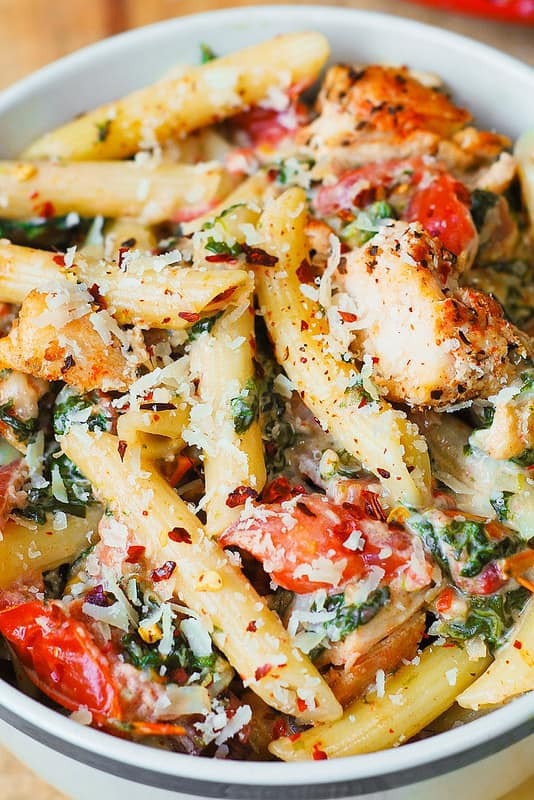 All you need to do is use gluten-free brown-rice penne pasta instead of regular penne. You can also use gluten-free quinoa pasta or lentil pasta. Half-and-half is the US milk product that combines 1/2 whole milk and 1/2 heavy cream or whipping cream to form a lighter cream (unlike heavy cream). Substitute 1/2 cup of milk + 1/2 cup of heavy cream for 1 cup of half-and-half. If you live in the UK, half and half would be the equivalent of single cream. Alternatively, you can mix half double cream and half regular milk (if you live in the UK). To cook pasta al dente (which literally means “to the tooth” or firm to bite), cook pasta about 2 minutes less than indicated on the package instructions. You can store this chicken pasta refrigerated in an air-tight container for up to 4 days. Reheat the pasta gently on stove top on medium-low heat, without simmering. Or microwave for 1 minute, checking for doneness every 30 seconds. Make sure the sauce does not overheat and separate. Keep in mind that reheating the cream sauce on high heat will cause the cream to separate. I do not recommend freezing this dish. 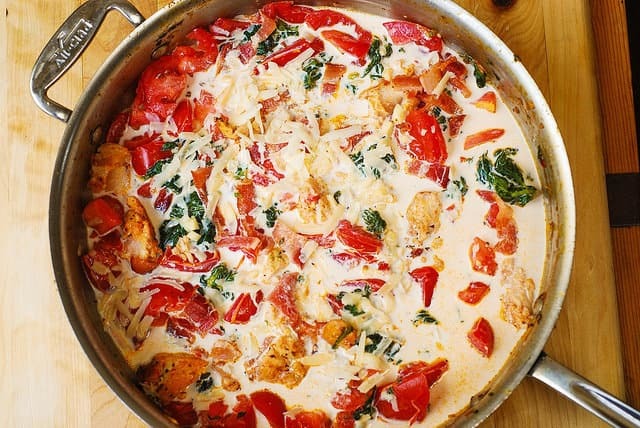 If you freeze it, the creamy sauce might not have the same texture when you reheat it. It might separate. Let’s be honest. 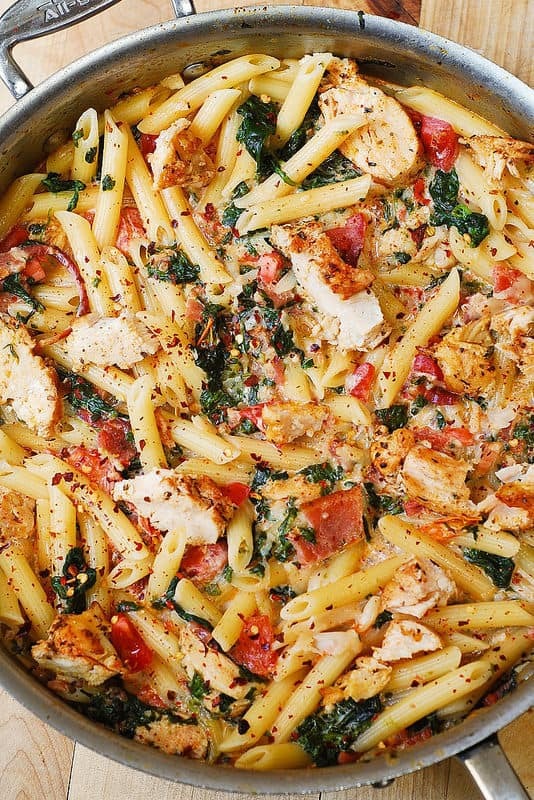 Chicken pasta recipes can get boring and repetitive. Not in this recipe! Here, you sear the chicken (with spices), then mix it with vegetables, bacon, and coat it in garlic cream sauce. So good! 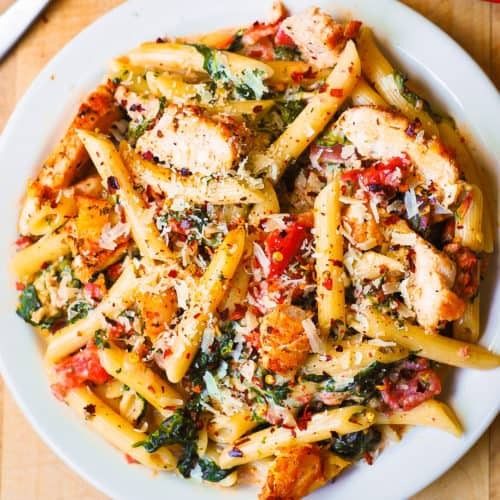 This chicken and bacon pasta recipe is so easy to make and uses such basic ingredients, that you can easily make it on a regular busy weeknight! 1) In a large skillet, on high heat, heat 2 tablespoons of olive oil until hot. Add chicken breasts (or tenderloins) and cook on one side on high heat for 1 minute. 2) While the chicken cooks, sprinkle the uncooked sides of chicken with paprika and Italian seasoning. 3) Flip the chicken over, and cook on the other side for 1 minute on high heat. Reduce heat to medium, flip the chicken over again and cook, covered, for several more minutes until no longer pink in the center. 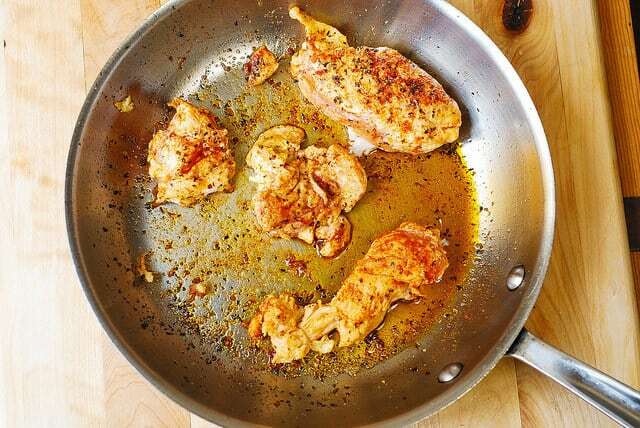 Remove the chicken from the pan and keep the chicken warm. 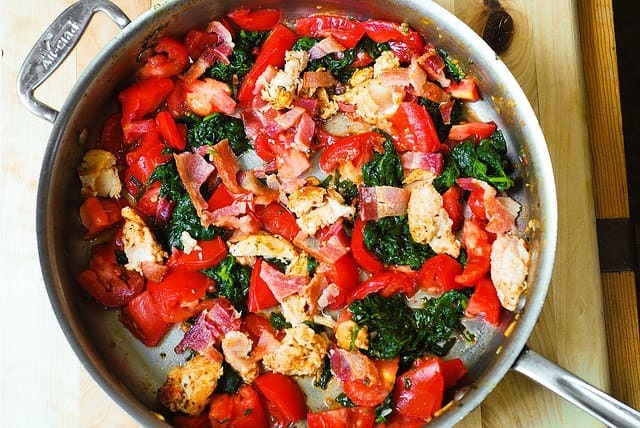 4) To the same pan (but without chicken), on medium heat, add chopped tomatoes, spinach, garlic, crushed red pepper, 1/3 of the chicken (sliced into small strips) and half the bacon (it should be already cooked and drained of fat). 7) Immediately reduce the sauce to simmer and stir, while simmering, until the cheese melts and makes the sauce creamy, only about 1 minute (at most 2 minutes). Then, immediately remove from heat. Season with more crushed red pepper and salt, if needed. 9) Add cooked pasta to the skillet with the sauce. 10) Add remaining half of bacon (already cooked and drained of fat). 11) Season with more salt if necessary. 12) Slice the remaining 2/3 of chicken into thin strips. 13) Top the pasta with chicken strips and finely shredded Parmesan cheese. A salad, of course! I would serve a very simple and basic salad (that you don’t even need a recipe for) with greens, such as spinach salad or arugula salad with toasted nuts, such as almonds or pecans, with a dressing made with olive oil and balsamic vinegar. Or, you can also use creamy dressing, in which case add tomatoes and avocados to your greens. If you want a more sophisticated salad, I would serve this chicken pasta with my absolute current favorite avocado salad with mozzarella and basil pesto. I also highly recommend this amazing beet salad with spinach, goat cheese, and cashews, and a beautiful strawberry spinach salad. Add pasta to the skillet with the sauce. Add remaining half of bacon (cooked and drained of fat). Season with more salt if necessary. Slice the remaining 2/3 of chicken into thin strips. To serve, top the pasta with chicken strips and shredded Parmesan cheese. WHAT IS HALF AND HALF? Substitute 1/2 cup of milk + 1/2 cup of heavy cream for 1 cup of half-and-half. We adjusted for gf issues, paprika & oregano allergies. Added a bit of rosemary & sprinkled a bit of turmeric over the top. Guests & husband loved it!